I've referred to this book several times on this blog but I've never actually done a review. This post aims to change that. When we were initially struggling with the Aspergers diagnosis for my eldest son, we jumped into a whole heap of complicated books. They were generally a good read but most of them were way too clinical. Then I heard about this book and I decided to buy it off amazon without having even looked inside. I couldn't find it in any Australian bookstores though funnily enough, now that I know what I'm looking for, I've seen it lots of times. I suspect that had I seen inside the book before I bought it, I might have had second thoughts about buying it but then, I would have been wrong. It's not just the covers that you shouldn't use to judge books by - sometimes you really do need to read them first. At first glance, the book looks quite shallow. It's sort of like the famous "blue day book" except that all of the pictures are of cats - and I'm much more a "dog person". The layout of the book is one big colour picture per page and one or two lines of text. Read it through cover to cover and it's a completely different experience. Each page introduces a new concept or puts a different spin on an old one. It's just a line or two of text of text and a picture of a cat - so it's not detailed in any way but somehow between the line and the picture, you really end up thinking about what is being said. The book is very linear though and each page builds on the others which precede it (you shouldn't start reading from the middle). By the end of the book, you have a firm grasp of the outward signs of aspergers and at least a general idea of what it feels like to have it. You will probably have picked up a few good parenting tips along the way too. My eldest son, who struggles with his reading but at 10 is just starting to read books without pictures, finished "All Cats Have Asperger's Syndrome" in a single sitting. It's easy enough to be accessible to him. It also provided an amazing opportunity to discuss how he feels. In fact, I'd classify our conversation during and immediately after reading the book together as one of the most important conversations we've ever had. He really opened up. 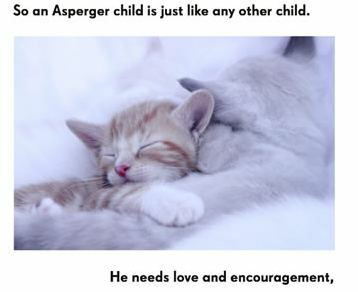 I'd strongly recommend "All Cats Have Aspergers Syndrome" to anyone with aspergers in the family and to all teachers and practitioners who deal with children with Aspergers or High Functioning Autism. It's one of those books you simply must have available for discussions and explanations with parents, relatives and educators and it has amazing potential to get your child talking about how they feel. 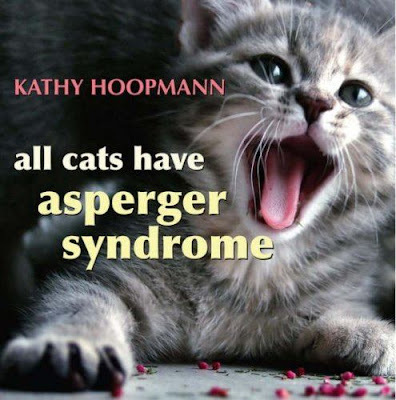 All Cats have Asperger Syndrome is available on Amazon and in most good bookstores. There's even a companion book called "All Dogs have ADHD" which I haven't read yet but it sounds interesting. Honesty Clause: This wasn't a review copy. I went out and bought this book - and I'm very glad that I did. I have this, and I *am* a cat person, so it's doubly fun for me. Living with three very, very "special" cats (one has pica. among other things). I like that it explains things very simply. I think that it is a fantastic tool for AS kids tounderstand themselves better, with pics of cute fuzzies to make it seem less confusing/scary. After all, if kitties are aspie, how bad can it be? It's gentle but effective and achieves in a very simple way that most people can sit through. If you give someone an Attwood book I bet they wouldn't get through it. But give them this, and at least there is a starting point for a discussion. Recognition doesn't just help a child who might feel alone and different. It's as important for family, friends, and other children to know that the kid with ASD isn't alone. This was our FIRST book on Aspergers - it happened to be in the school library. I had a tear in my eye and a smile on my face at the end. I had this book in my hand when I sat down with my 10-year-old son to tell him his 'diagnosis'. No doubt what I said was gobbledegook to him, but then we went through the pages of All Cats ... I asked him to tell me which bits were like him, and which weren't ... He happily said yes to some and no to others, and seemed intrigued that someone had seen these things in people like him. One of the greatest things about this book is that ultimately it says 'yep, you're a bit different but, you know, there's some great things about people with Aspergers and we should let them be themselves'. I had worried the picture book might be a bit 'young' but he loved it then and regularly picks up it again... Highly recommended. We found this book at our local library just after Heidi has been diagnosed and it was such an eye opener. For her 3rd birthday instead of giving out goodie bags to the families that came along we gave each family a copy of this book. It helped so much to educate friends and family. Since then our Pastor has read it out at Church to the children during the childrens sermon to explain why Heidi does things differently sometimes. We've given copies of the book to Heidi's preschool and next year to her school. When Annie was diagnosed we read this book together and talked about what having Aspergers would mean for her. Such a wonderful book. I'm in awe of how much Kathy manage to convey in such a easily accessible way. Good review. Now I want to go out and find it. when my youngest and i first found this book we plopped right down in the middle of the bookstore isle to read it - and bought it and love it - makes me cry in the best possible way! I always said my daughter is like a dog... and my son like a cat... I can't wait to read the book! :) Thanks! We used this book to introduce the concept of Aspergers to my son, who was 6 years old at the time. We read each page and asked if he felt the same way as each cat, and he agreed with probably 80% of the descriptions. After reading it through a couple of times, we were able to explain that he had aspergers just like the cats. I think because it was a cute and laid-back book, he accepted that information easily. This looks wonderful. I really like the idea of giving it to friends and family to read. I have asperger's, have read the book, and agree with you. For those who don't know about AS but want to, this is a very educational book. The photographs are beautiful as well. When we told our son about being a 'Cat' we used this book, and the visuals made it so easy for him to understand and empathise (Ha!) with the cats (And as a 2 cat house he knows he is one of 4 'Cats' in the building, me included). Just a fantastic book and one I would recomend to anyone and everyone - this has been on loan to anyone who needed to understand. I have not read this one yet but now I will. Thanks for the great review! I run a support group for parents with children on the autistic spectrum, and I've bought and given away about 6 of these books so far - I have found it one of the best teaching tools for parents and for the children - nearly everyone finds it very helpful.